If you laptop or PC is overheating and getting too hot then it’s important that you don’t just ignore it so in this article I’m going to run through the main reason why you should keep your computer cool and what to do if it gets too hot. There are lots of reasons why overheating is important. First and foremost if your computer gets too hot then there is a very likely risk that it will simply stop working (which can be an inconvenience!) but this is usually in extreme cases where the internal fans have failed or where ventilation is extremely bad. More than likely your computer will just “throttle back” which means that it will significantly slow down until it drops back down to a safe temperature – in the same way you might stop and drink some water during heavy exercise until you cool off. When your computer throttles back it will perform considerably slower than normal and you might see long loading times and choppy performance which can be extremely frustrating and harmful to your productivity. If your computer runs hot for prolonged periods of time then the heat can also begin to degrade your internal components and shorten the lifespan of your computer. The internal components will become much more likely to fail and your data and files will be at risk. Often your computer will tell you if it’s getting dangerously hot, in Windows a message will pop up in your notification area at the bottom right of the screen to tell you that the system is unstable. If the internal fans are always silent even during intial boot up then this could mean a fan failure (most computers will test the fans as part of the boot up process). When it comes to looking at your computer temperature the first thing you will discover is that there is not one temperature but a wide range of temperatures coming from all the different little thermometers inside your computer. The important one to note is the core temperature which tells you the temperature at the heart of your CPU processing cores. You might also have a system temperature which is the ambient temperature inside your computer case and not quite so important. Gaming computers will also have a gpu core temperature which is the temperature of the graphics processing chip and many even have a memory temperature which is the temperature of your memory modules. Any temperature below 60°c is generally considered safe and well below any risk of problems. If your system temperature is this high though then that could spell trouble because for the ambient temperature to be this high, the internal temperatures of the components must be extremely high. If the core temperatures are anywhere between 70°c – 80°c then this is high but not unusually so. During intensive processing it is not unusual for your core temperature to reach the high 80s and laptops especially can get very hot when doing a lot of work. If you processor has been “overclocked” to run faster then it will also be hitting high temperatures. Anything 90°c or above is a danger sign which means that either a fan has failed or it is unable to cool the cores adequately. If your core temperature stays above 90°c for a prolonged period of time then you system will likely power itself down as an emergency measure to protect the components from damage. My computer is running too hot! What should I do? The most important step is to ensure that the PC is positioned in a ventilated spot and that none of the rear or side vents are obstructed. It is better positioned on a desk than on the floor and if you’re stuck in a broom closet then consider purchasing a room fan to get some air circulation around the room. If your PC is boxed inside a desk or cupboard then ensure that there are air gaps around the side and to the rear of the unit so that the fans can still do their job. The second most important step is to clean your PC out regularly! Unplug the unit and use a Philips head screw driver to remove the side panels and then use a compressed air canister (available in any hardware store) to clear the dust out of the fans and copper heat spreaders (the strange square things with lots of fins). If you can’t afford a compressed air canister then a quick, hard blow through pursed lips can often shift some of the worse dirt and a soft brush (such as a make-up brush) can be used to brush away the worst bits. Also try to regularly vacuum your office or work area so that there is less dirt and dust around to be sucked into your fans. 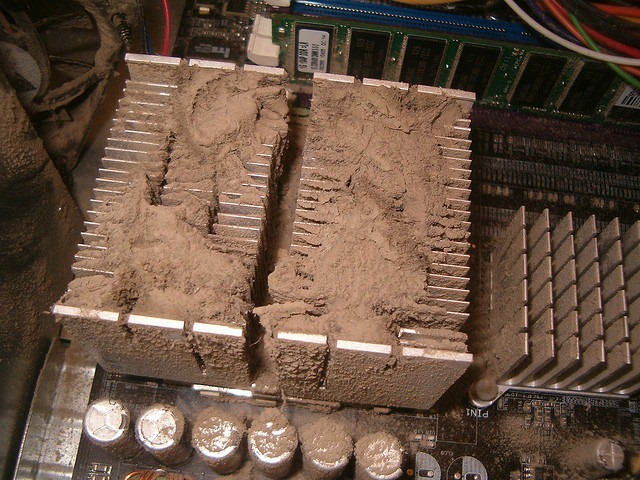 In some severe cases where cleaning and ventilation doesn’t help you might have to consider replacing the fans or the thermal compound inside your computer to improve cooling. This work should be undertaken by an IT professional so take it into your local repair shop and ask for a quote. The parts themselves are very cheap (case fans are a few pounds each and thermal compound is also a couple of pounds). However if your main CPU cooler needs replacing then this maybe a little bit more expensive as these can cost £10 – £20 or more for a really good one. Finally, take a look through your installed programs and check that you don’t have any applications installed which might be over clocking your system and causing it to run hot. These applications might be called things like “super charger” or “over drive” or something like that. You should also look for programs which might be thrashing your computer and not giving it chance to rest. Some virus scanners, search apps, backup or cloud storage application and update tools can often be bad for this so check through and remove anything problematic. Always check with whoever else uses the computer though before you remove all their programs! As with PCs you need to make sure your laptop is positioned in a well ventilated area and that the vents are unobstructed. If you have vents on the underside of your laptop then consider raising the unit up on a stand (or just stick a couple of lego bricks under it) to raise the vents up off the desk so that air can freely move around it. Laptops can be more difficult to clean that PCs but it is still worth buying a can of compressed air and blowing out the vents every once in a while (make sure you switch it off and unplug if first). Be careful because this can end up pushing some dust deeper into the laptop so try to blow from the intake vent (on the underside of the laptop) out through to the outlet vent (usually on the rear or side) and only use a few short, sharp bursts of air rather than prolonged blowing. If you can’t use compressed air then it can be worth taking it to an IT Professional who can open up the casing and give it a proper clean through. If your fans have become damaged then they can also replace these for you so ask for a quote. Laptop fans can be a bit more expensive than PC fans because you will often need a specific part from the manufacturer but even in a worse case scenario you should only be looking at £15 – £20. If your laptop still overheats then consider buying a laptop cooling stand which is like an external case fan for your laptop. They cost about £10 – £30 and not only provide good ventilation but also help to get more air flowing through your laptop vents. Finally, take a look through your installed programs for applications which can be causing your problems (as per point above). Overheating PC or laptops can be extremely frustrating and if the problem is left untreated it may lead to data loss or total system failure. If you would like more information or if you would like us to take a look at any PCs in your business then don’t hesitate to contact us!